Besides facing a charge motor vehicle theft a 24-year-old man who stole a Toyota pick-up from his employer in Windhoek will also be charged with culpable homicide after an accident near Okahao killed a passenger he was transporting. 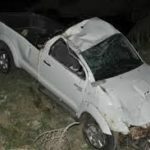 According to Warrant officer Anna Kunga, spokesperson of the Namibian Police in the Omusati Region the fatal motor vehicle accident occurred on Thursday at around 22:40 on the main road between Tsandi and Okahao at Okakundu village. According to Kunga the suspect was driving a Toyota pick-up with registration number N39598W from Okahao to Tsandi when he lost control over the motor vehicle. 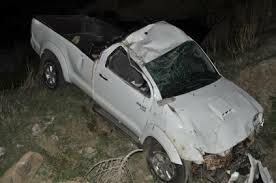 The vehicle hit a big mopane tree next to the road and the impact of the crash caused the pick-up to roll several times. Warrant Officer Kunga said a case of culpable homicide as well as one of motor vehicle theft was opened with the Omusati Police.